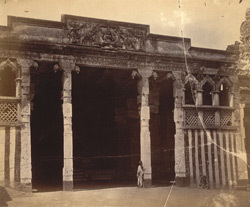 Photograph of the Kalyana Mandapa in the Minakshi Sundareshvara temple of Madurai, taken by Nicholas and Company in c.1882. The Minakshi Sundareshvara Temple is dedicated to Shiva and his consort Minakshi, an ancient local divinity. The construction of this imposing temple-town was made possible by the wealth and power of Tirumala Nayak (1623-1659). He was the most prolific builder of a long line of Nayaka kings, a dynasty who ruled a large portion of Tamil country in the sixteenth and seventeenth centuries. The rectangular temple precinct covers six hectares and has eleven huge towers and four entrance gopurams. Inside this enclosure there are columned mandapas or porches, tanks, shrines and temples dedicated to Shiva and Minakshi. Images of Minakshi and Sundareshvara are brought to the location shown in this photograph as part of a festival that celebrates their marriage.